The signboard-hanging ceremony of KOGIC was held at UNIST on June 19th, 2017. The official signboard-hanging ceremony of KOGIC, held on Monday, June 19th, 2017. 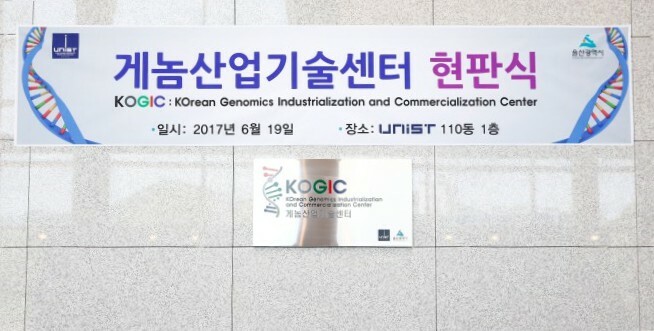 The official signboard-hanging ceremony of the Korean Genomics Industrialization and Commercialization Center took place in the Engineering Building 110 at UNIST on June 19, 2017. The center, located on the 3rd floor of the newly-constructed UNIST Engineering Building, has benchmarked multidisciplinary research facilities around the world, including Massachussetts Institute of Technology (MIT), the world-renowned research university. It has an area of 820 square meters and includes genomic analytical laboratories, wet laboratories, sample storage rooms, cell culture incubators. 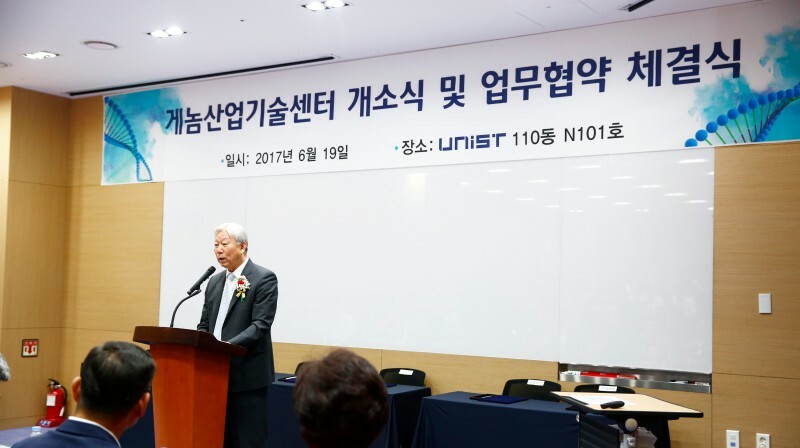 The signboard-hanging ceremony of KOGIC, held at UNIST on Monday, June 19. 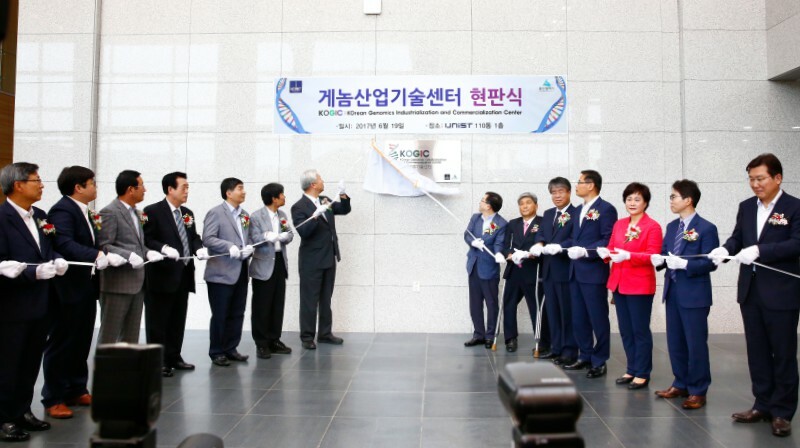 This ceremony was held not only to mark the official launch of the Korean Genomics Industrialization and Commercialization Center (KOGIC), but also to celebrate the establishment of MoU among UNIST, Ulsan city, and four other organizations, including the UNIST-based venture company: Geromics Co. Ltd., Clinomics Co. Ltd., Theragen Etex Co. Ltd., and ZeroTech Co. Ltd. 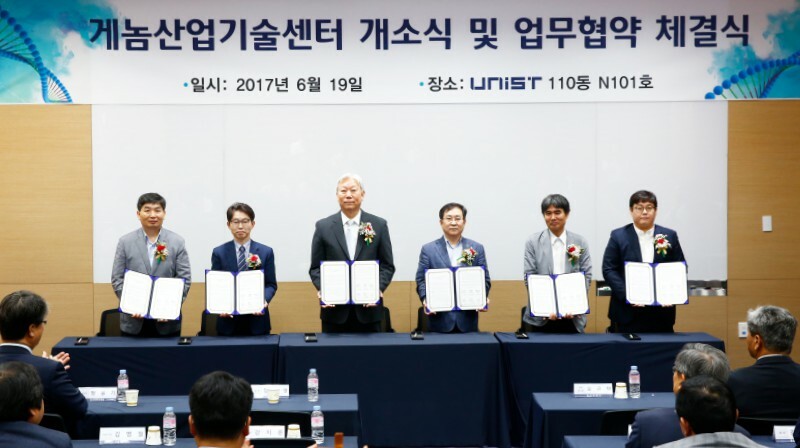 Under this partnership, UNIST will direct the Ulsan 10,000 Genome Project, dubbed “Genome Korea in Ulsan”, as well as the industrialization of genome-based technologies. The city of Ulsan will provide general assistance in the overall management of the project. Theragen Etex will be in charge of the production and processing of genomic data and cooperate to provide support for technology commercialization. Professor Jong Bhak of Natural Science at the signboard-hanging ceremony of KOGIC. 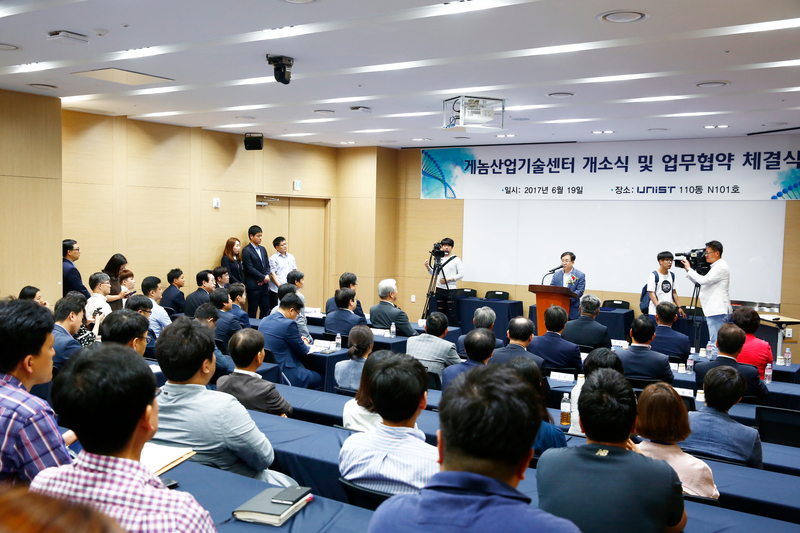 Led by Professor Jong Bhak of Natural Science, the center aims to create long-term profitability in cooperation with local businesses, thereby accelerating the pace of genome industry in South Korea. 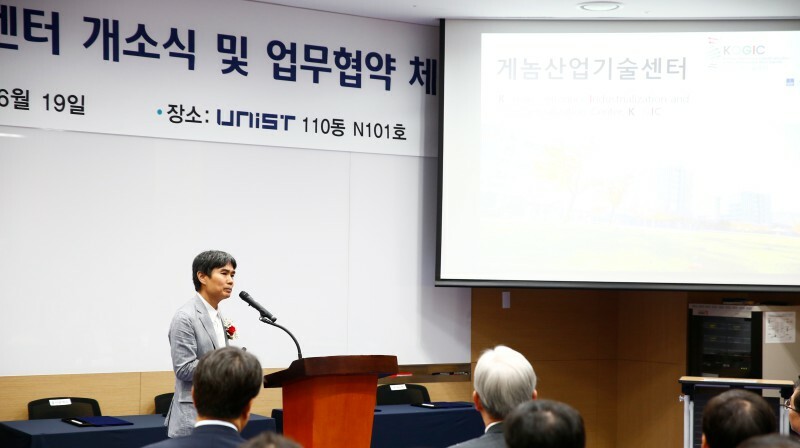 With the help of this center, UNIST will develop new and improved genome-based technologies and promote the commercialization and industrialization of such new technologies. Geromics will be responsible for developing technologies, related to supercomputing system for genome analysis, big data analysis, artificial intelligence in bio medical field, as well as medical diagnosis. Clinomics and ZeroTech will develop genome-based devices and molecular diagnostic techniques, as well as conduct joint research projects. 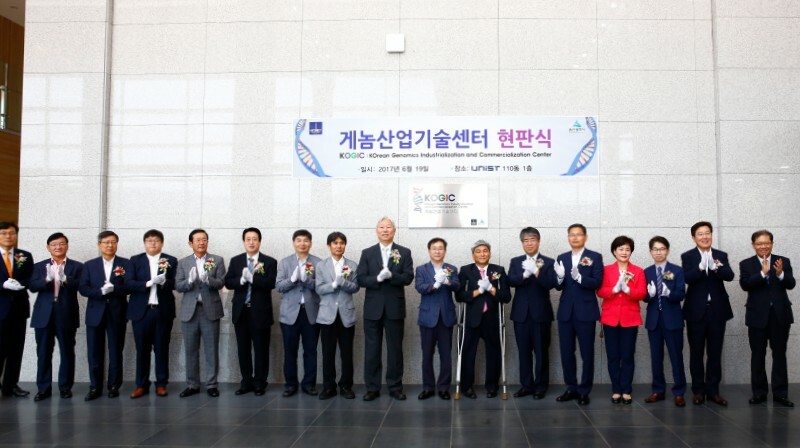 “The Korean Genomics Industrialization and Commercialization Center is the world’s first research center for genome technologies that aims to build South Korea’s future bio-health industrial base by providing health care benefits of personalized medical care and precision medicine, which are the fruits of the genomic industrial revolution,” says Professor Bhak.